A Eurorack compatible USB MIDI to CV converter uses the Teensy 3.1 microcontroller as its USB port and controller. 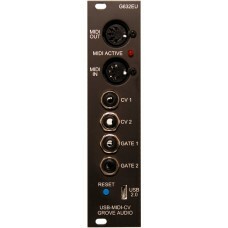 The 6HP wide unit includes 2 CV channels, 2 gate channels, an isolated DIN MIDI input connector and a DIN MIDI output connector. The control voltage output range is internally settable to 0-10 Volts or -5-+5 Volts. The gate signal is 0-5 Volts active-high. The software for the unit is open-source and can be reloaded and modified by the user. A programming development environment that utilizes the Arduino IDE with a Teensy support add-in can be used to create new functions using Arduino-like commands. The module will be available in the Synth Store either assembled or as a complete kit. A demo program will be available that provides a two CV output and also allows USB MIDI note commands to be sent and received from the serial MIDI ports. The panel is 5.03 inches tall and 1.20 inches wide (6HP). The depth behind the panel is less than 2.0 inches. 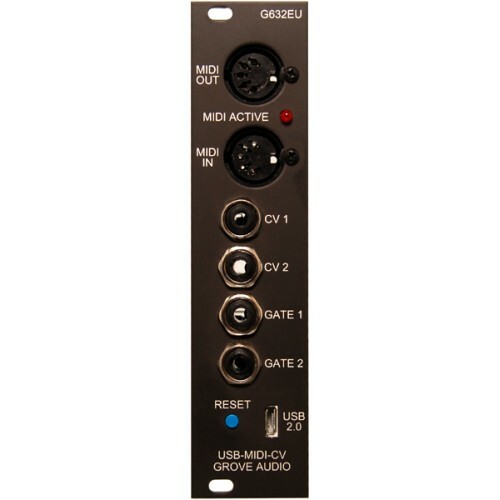 The module is designed to be used in a standard Eurorack synthesizer case and has a IDC-16 pin Eurorack power connector. There is a jumper selectable +5 Volt regulator on-board which can be used if the Eurorack system does not provide +5 Volts. The panel is black anodized with clear printing. This intermediate experience level kit contains all the parts necessary for construction including solder, a USB Micro B to A cable and detailed, fully illustrated, assembly instructions. Users need to supply a medium-fine tipped soldering iron, long nose pliers, and diagonal cutters for assembly. The kit comes with a 3D-printed bending gauge to allow neat bending of component leads. There are no surface mounted parts used in this kit. The Teensy 3.1 is a powerful microprocessor card containing a 72MHz Freescale MK20DX256 Cortex-M4 processor and USB communications processor on a 3/4 inch by 1 1/3 inch PC board. It has 256KB of program memory and 64KB of RAM. There is a Teensyduino add-in available for the Arduino IDE that allow sketches developed in the Arduino enviroment to be loaded into the Teensy. A demo program will be available for download that causes the module to perform as a USB MIDI to CV converter. It will also allow MIDI commands to use the MIDI I/O connectors. Source code for the project will be available for download.